Warming Signs: Why Are Governments Killing Environmentalists? Berta Cáceres was at home on March 3, 2016, when the gunmen stormed her house in Honduras and killed her. The attack likely didn’t come as a surprise for the environmental defender; before her death, she warned of 33 death threats and a hit list with her name on it. A 20-year-old first sergeant in the Honduran military later confirmed that her name had appeared on a hit list distributed among special forces units (military units that were trained, as it happens, by the United States). The murder made headlines around the world. Cáceres was the recipient of the prestigious Goldman Environmental Prize, and her work as an environmental activist reached global audiences. Isidro Baldenegro López, a smallholder farmer and another recipient of the Goldman Prize, was killed last month in Mexico. The high-profile work of activists like Cáceres and Baldenegro has often been successful in halting or delaying destructive activities, and their leadership inspired other environmental defenders to follow suit. But this work has never been more dangerous. Murders of environmental activists reached an all-time high in 2015, the last year for which there are analyses. Most of these deaths don’t make the headlines, and others are likely never reported at all. In 2015, more than three environmental defenders were killed every week, Global Witness reported murders in all, constituting a rise of nearly 60 percent from the previous year. “I am extremely appalled by the number of killings and attacks and the lack of response from states,” Michel Forst, the United Nations special rapporteur on human rights defenders, wrote in a recent report. Even as countries around the world made progress with the Paris climate deal, climate activists face more persecution than ever. Attacks were most prevalent in Latin America and Asia, but activists all over the world have been threatened and harmed. More than half of the murders happened in three countries: Brazil (50), the Philippines (33), and Colombia (26). Brazil had by far the most deaths; many individuals targeted were either subsistence farmers or environmentalists working to protect swaths of the Amazon. However, as UN rapporteur Forst highlighted in his report, violence around land rights is an issue that crosses borders. “Much of the demand for the resources in those countries comes from countries in the global North,” he wrote. As the worldwide demand for natural resources grows and companies encroach more upon indigenous lands, environmental issues have become a new battleground. “Conflicts over mining were the number one cause of killings in 2015, with agribusiness, hydroelectric dams and logging also key drivers of violence,” Global Witness reports. Amnesty International has created a map and database of stories about such clashes in the Americas. “More than ever before, environmental activists are the targets of a ruthless campaign aimed at stopping them from protecting vital natural resources,” Erika Guevara-Rosas, Americas Director at Amnesty International, said in a statement. Indigenous defenders, like Cáceres and Baldenegro, often form the backbone of these protests—and they are targeted in turn. In Global Witness’s 2015 calculations, nearly 40 percent of victims worldwide were from indigenous groups. In the U.S., protestors focusing upon resource extraction have made the Dakota Access and Keystone pipelines household phrases; however, they have faced risks to their health and safety in the process. Bella and Dabelko at the New Security Beat recommend providing political and financial support for regional human rights initiatives and encouraging businesses and governments to recognize the rights of environmental activists. And, sad as they are, high-profile cases like those of Berta Cáceres and Isidro Baldenegro López draw international attention to these causes, encouraging more groups to fight for environmental preservation. Cáceres, had she lived, would have been recognized as a UN Environment Champion of the Earth in December; in her stead, her brother Juan Manuel Cáceres received the award. 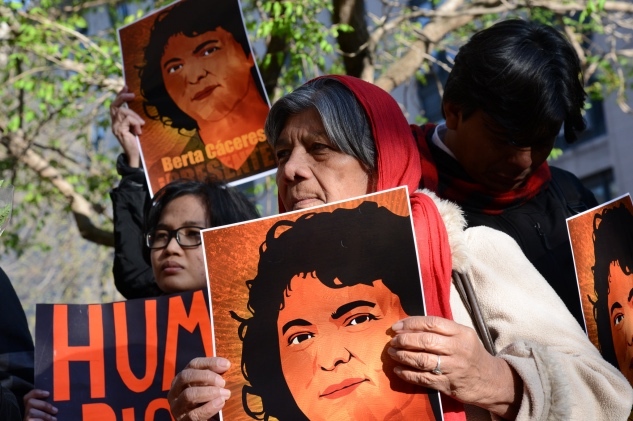 “Berta didn’t die, she multiplied,” Manuel Cáceres said in his acceptance speech.